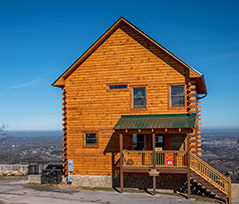 Your 3 BR 3 BA cabin is conveniently located only 4 miles from downtown Pigeon Forge. The main level and lower level areas feature the master suites. A spacious upper level loft bedroom area offers a reading/sitting area, television, and a bathroom. 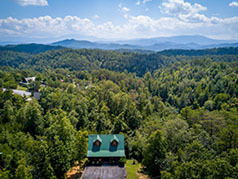 This Pigeon Forge cabin offers all the amenities you need for a family getaway in the Smokies. 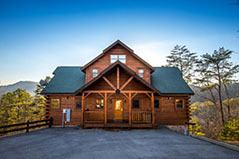 Luxury Custom Built Cabin, just 5 miles from the main parkway in Pigeon Forge. The main level features a fully equipped kitchen, a bedroom that features a king size bed, 32 inch LCD flat screen television, and a bathroom with whirlpool and walk-in shower. The main level living area has a sleep sofa, 55-inch LCD flat screen TV/Blue Ray DVD Player, and half bath. The lower level has 2 bedrooms and an additional twin sleeper sofa per bedroom. This cabin is pet friendly. A wall of windows overlooking the valley is the first thing you’ll see when you enter this comfortable cabin. Cathedral ceilings soar over the oversized master loft bedroom that boasts a king size bed, double whirlpool, TV with DVD player, and a cozy sitting area. Outside on the deck, rocking chairs are the perfect place to enjoy a morning cup of coffee, and the large Jacuzzi is the perfect place to unwind and relax after a day of hiking or exploring nearby towns. 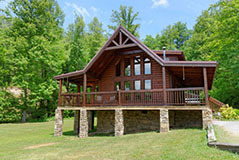 Bear Hearts is a lovely 1 BR log cabin about 3 miles from Pigeon Forge. There is a heart shaped whirlpool in the den, hot tub on screened porch, electric fireplace, 1 BR with handmade king log bed, 42 inch flat screen TV, DVD player, one full bath, pool table. A theater system in the living room features a 65 inch flat screen TV with a blue ray system and surround sound-sound bar. When you walk into the cabin you are greeted with the warmth of all the woodwork in the cabin. There is a fully equipped kitchen with coffee maker, dishwasher, and microwave. The living room features 2 gliding chairs and an electric year round fireplace. There are 2 master suites on the main level and a deck with hot tub and beautiful mountain views. Upstairs are 3 BR, 3 BA. The upper level offers a large walk out deck with a spectacular mountain view. 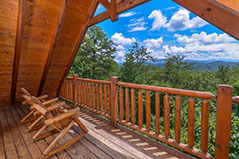 Enjoy the Best Views in Pigeon Forge from this cabin. The main level features a fully equipped kitchen and large dining area. The living room has an electric fireplace, flat screen TV, and sleeper sofa. There is a main level deck area perfect for enjoying your morning coffee while admiring the views. The upper level of has a Master Suite fit for a King plus an additional BR. The lower level has a game room, 3 BR and hot tub on the deck. 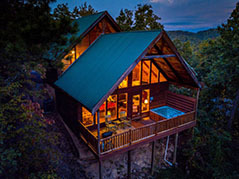 This spacious cabin is located at the water’s edge of a mountain creek. There are literally waterfalls in the backyard! The upper deck offers plenty of seating overlooking the waterfalls. The lower deck expands across the back of the cabin and provides a path to access the creek to do some fishing or wading! 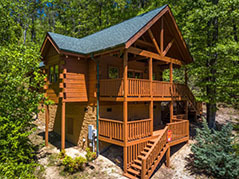 Granny’s Creekside Cabin is wheelchair friendly on the main level. Granny’s is also a fisherman’s dream. The back deck is so convenient that you can call your fishermen in for lunch without having to leave the cabin. 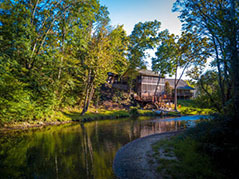 Enjoy a private view and access on the Little Pigeon River. The Master Suite has a king size bamboo adjustable/massaging bed w/36" flat screen. Master bath offers walk in shower, waterfall whirlpool, 36" flat screen, walk-in closet, and 2 sink areas. A walk out from the lower level screened in porch leads to the lower veranda located above the Little Pigeon River. It offers table w/6 chairs, 2 loungers. There is another outdoor grilling area just steps from the rushing water of the Little Pigeon River. 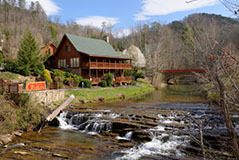 What a great place to catch trout or just get away from it all. This luxury custom-built log home has three levels of outdoor wooden decks with gorgeous mountain views.The interior features include top-of-the-line furniture, beautiful kitchen and wonderful attention to interior design throughout the cabin. It also features a hot tub on the bottom deck and a foosball and pool table located in the spacious cabin loft. This cabin has it all - a one bedroom full bed, full bath with whirlpool, living room with 42 inch flat screen, dining room and hot tub area glassed in. Upstairs offers loft bedroom with queen bed and full bathroom. The view from this cabin is great facing a pond. 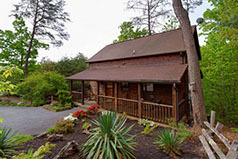 A great Tennessee cabin located near all the attractions of Pigeon Forge. Offers great fishing, too.